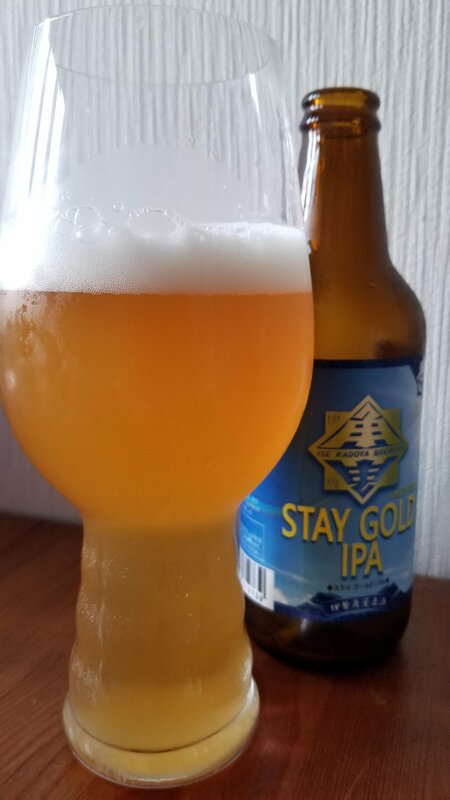 Ise Kadoya Stay Gold IPA is a 6.5% American IPA from Ise Kadoya, based in Mie, Japan. It’s part of their limited edition range and can be found in both bottles or on tap across Japan. The idea behind Ise Kadoya Stay Gold IPA was to make something drinkable and light for the hot summer months in Japan – I’m guessing they didn’t predict the 35c+ temperatures though in 2018. At the time of writing, it’s unknown whether Ise Kadoya Stay Gold IPA is a one-off or more to come. Ise Kadoya have been really going for it with IPAs this year and Ise Kadoya Stay Gold IPA is another notch on the brewery post. It poured out a slight hazy golden yellow colour with a dense white head on top. There was, what is seeming to be a common occurance for Ise Kadoya, a light citrusy lemon and grapefruit note to it which would be nice on a hot summer day. There was a subtle crisp biscuit nose from the malt that was light and not overly sweet on the nose. Ise Kadoya Stay Gold IPA had a light, dry body with the citrus flavours coming through strong behind the bitter bite. There was a distinct lack of sweetness from the base, so Ise Kadoya Stay Gold IPA would be more than drinkable on a hot summer’s day. The lingering citrus flavours continued going through to the aftertaste but remained briefly. If Ise Kadoya were going for something light and crisp, then they’ve succeded with Ise Kadoya Stay Gold IPA – but then it’s not hard to make a light crisp IPA.